If you are still looking for a soft, kid-friendly surface for the floor of your baby, you are being the right place now. The following five mats can let your baby stay safe, even have a fun when he/she plays on it. Further, to some extent, the mats with the colorful elements can develop the basic cognitions of your children. It is worth every penny, you never be regretful to buy them. 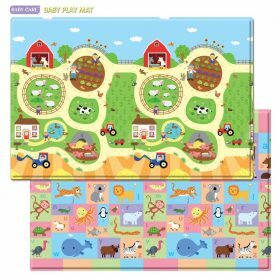 The play mat is great for your baby who is learning to crawl. It is large and soft so when they tumble they don’t get hurt. It fills a good chunk of space, so that you can actually get down on the floor and play with your baby without being on the hard floors. It is easy to clean. A bowl of warm water with a little bleach or a Clorox wipe gets the job done. 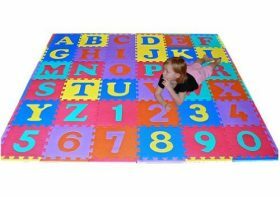 This mat includes 26 uppercase letters and 10 numbers that can pop out for hours of learning fun. The straight borders included give the mat a finished look. The Learning Carpet is made of 100% Nylon that is soil and stain resistant. Colorful carpet features a whimsical cityscape, which measures 27 by 79 inches. The rug is quite fun, with houses, a duck pond, zoo, park, school, etc.–all in slightly “off” perspective. The lanes on the streets are the perfect size for matchbox-sized cars, for when your little one is older, but toddler-sized cars work just as well. Kids can play with the Giant Road Carpet while simultaneously learning about directions, streets and traffic. Its no-slip backing provides safety on tile or wood floors. 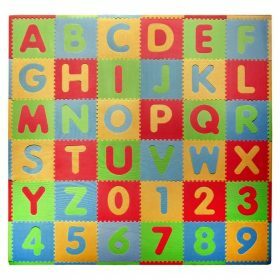 This mat has all alphabets. And it includes 36 foam pieces with removable letters and numbers and 24 border pieces. The Tadpoles ABC Floor Mat covers 36 square feet. It’s a great alternative to laying blankets on the floor that slide around. It is easy to put together, thick enough for your baby to fall on and get right back up and keep moving. There are blue/brown, green/brown, pink/brown and modern colors for your selection. Your kid plays on it, moreover, encourages creativity and thinking. The Baby Care Play Mat, its soft floor surface for babies and children to play on from birth to school. The cushioned surface ensures a soft standing for rolling, tumbling and falls. Tested to European Toy Standards En71, it is hygienic and safe. This mat could have a very faint smell upon opening the package, but the smell will go within a day. The large size of this mat has various colors to chose. For example, busy farm, country-town blue, country-town pink, genius bear and pingko fridens. Its dimensions are 82.7 x 0.5 x 55.1 inches. It is perfect for reducing nose and impact, and a great insulayor on all floor surfaces. 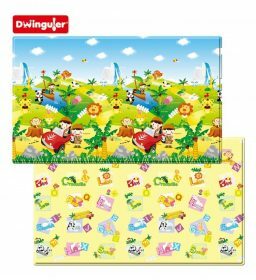 The Dwinguler Mat is soft, elastic and slip resistance. The innovative cushioning and embossing protect kids from hard impacts on the ground. It has cute elements with colorful pictures. There are five patterns. They are My-Town, Dino-Land, Green Garden, Safari and Sensory Development. This mat is manufactured with absolutely earth and baby friendly material. It is completely waterproof, easy to clean and sanitize from your child’s rugged playtime. Vividly coated on both sides with designs to help sensory development.